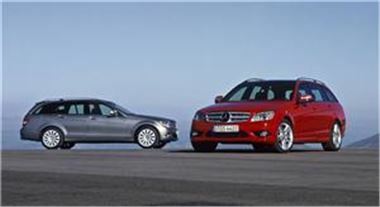 The estate version of Mercedes' C-Class estate has been unveiled months after the release of the original saloon model. According to the company, safety, agility and comfort have been combined with spaciousness and versatility when developing the unit, making it stand out from the rest of the market. Consumers with large families may find the easy loading and transportation benefits the car offers also helpful. Similarly, environmentally-aware drivers might be interested to hear that the vehicle burns 12 per cent less fuel than the outgoing wave of models and that it has already picked up an Environmental Certificate. "The new estate adopts the C-Class Saloon's customer-focused concept for the design and equipment lines. There is a choice of three models &#150; SE, Elegance and Sport &#150; which highlight the vehicle's comfort or agility to differing degrees," Mercedes commented. After having been originally established in 1900, Mercedes became Mercedes-Benz in 1926.